The Porirua Road was the only public route through The Halfway until the Wellington and Manawatu Company Ltd. commenced work on the railway line between Porirua and Johnsonville in c1883. The 1883 line was part of the main trunk line until the existing line (known as the Tawa deviation) was opened in 1937. When the Tawa deviation was being constructed, more than 300 men camped in the Public Works Railway Camp at Glenside. The Glenside portal is a feature of the Glenside suburb. The Glenside portal is the northern entrance to New Zealand’s fourth longest tunnel and Wellington’s second longest tunnel at 4324 meters. Here are some images of railway heritage in Glenside. 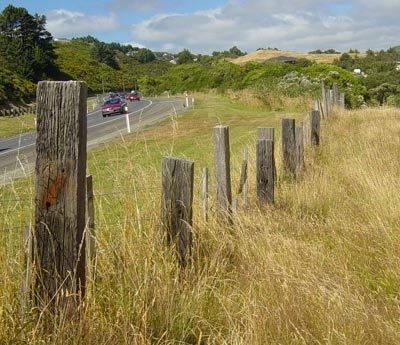 Location: Boundary fence between the motorway and a private farm, Glenside. The motorway was built on the route of the original railway line here. When the original railway line was laid, it split farm properties. About where this fenceline is, there used to be white painted railway gates enabling the farmer of this propertry, and his boundary neighbour, access across the railway line to their farm land on the other side of the railway. Before the railway line was built, the farmer of this property had a wonderful paddock. It was considered the best paddock on the farm and was called "The Hay Paddock" as hay was harvested from it. Even though the paddock was split by the railway and later the motorway, it is still known as the hay paddock today, more than 100 years later! Location: End of Rowells Road. The current owner of this gate says it was there when he bought the farm on his return from War Service in World War II. Location: Woodlands, 395 Middleton Road Glenside. Glenside Progressive Assn Inc. has asked Wellington City Council to list this site as a heritage item on the District Plan. A cone of vision and landscape protection is sought. Two tunnels were constructed on the Tawa Deviation. 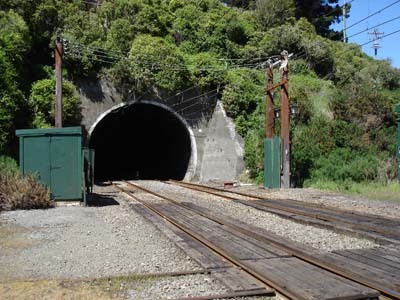 The Tawa 2 tunnel is New Zealand’s fourth longest tunnel at 4.33km and was opened in 1935. One portal entrance is at Glenside and the other is at Ngauranga. The survey peg marking the center line of the tunnel is located on private property in Glenside. 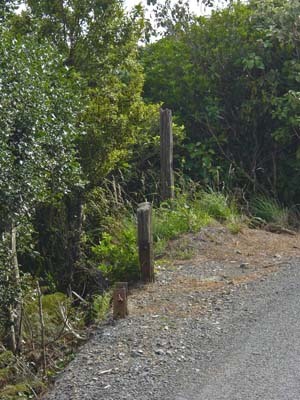 In front of the peg is a totara post stump. At its original height, the post served to mark the location of the peg and was visible by the surveyors from inside the tunnel mouth. Barry Sayer, surveyor and director of Truebridge Callender Beach Ltd. has suggested that the peg and stump should be protected because of its significance. He has provided the Association with a copy of the 1927 surveyors map depicting the location of the survey peg and its relationship to the railway construction. Rock crusher in Glenside. Photo held: R J Meyer Collection, Glenside Progressive Assn. Inc. Location: Rowells Road, Glenside. Parts of it can be viewed from Middleton Road across the railway corridor. 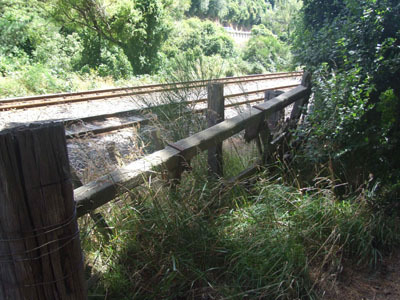 Glenside Progressive Association Inc. has asked Wellington City Council to incorporate a viewing point of the rock crusher into the proposed Middleton Road walkway. 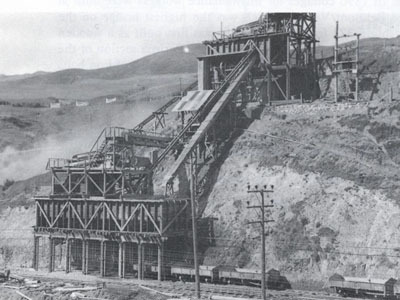 A giant stone crusher, also known as a rock crusher, was located north of the Glenside portal during the construction of the Tawa Flat Railway Deviation (1924-1937). Rock was removed from the tunnel by rail and crushed before being laid on the line as part of its foundation. The railway ties and the concrete foundations of the rock crusher are visible on Rowells Road and form part of the road itself. From Middleton Road there is a clear view of the base of the crusher, just above the railway line. 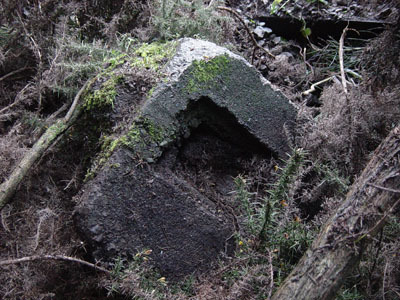 The following images show the remains of the rock crusher in Glenside. Location: Pukepuke, 355 Middleton Road, Glenside. A dammed stream provided the water supply for the rock crusher. The dam is privately owned and not accessible to the public. There is another railway dam in a tributary of upper Seton Nossiter Park. This dam provided water to the Public Works Camp. After the Public Works Camp pulled out, the dam supplied water for residents in the Glenside Village area. 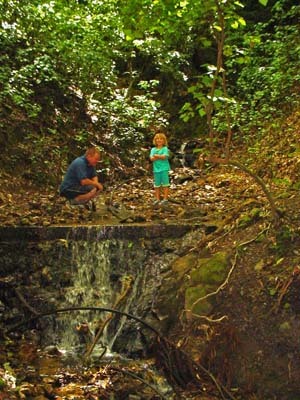 The pipes in the Seton Nossiter Park creek are remnants of this old water supply. Location: Private farm on Middleton Road. During World War II Middleton Road was the main road north of Wellington and was not called Middleton Road. 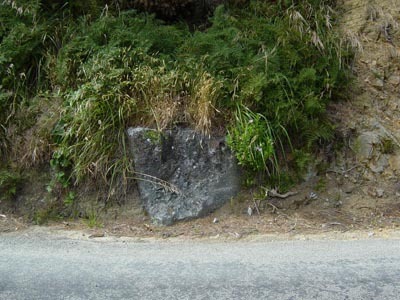 It was known as the Porirua Road, or the main road. There was no motorway. The main road and the railway through the steep Glenside valley were able to be "blocked" to prevent the enemy's advance. 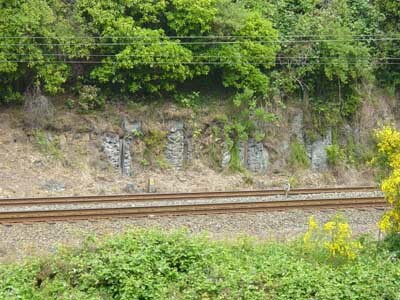 Much of the infrastructure constructed to block the road and railway has been pushed onto land and down the streambanks nearby.These pieces here were re-discovered in 2008 by railway workers upgrading the electrification of the main trunk line. A Glenside house with a foundation/piles made of old railway bridge. Glenside Reserve, formerly home to the the Public Works Camp with unconfirmed remnants of the 1883 railway across the top of the reserve. On the motorway, in the southbound lane south of the Glenside/Grenada/Churton Park interchange there is a cutting into the bank adjacent to Mark Avenue. This is where the original railway track lay. Before the motorway was built, the railway cut through hills here to cross the top of todays Glenside Reserve. The only “green bit” of rural zoned main trunk line between Plimmerton and Wellington City. 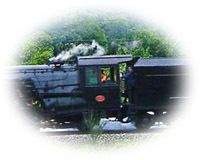 Good viewing sites for photographing steam trains on the 1937 line through Glenside. Rowells Road, part of which was developed from tramline used in railway development. 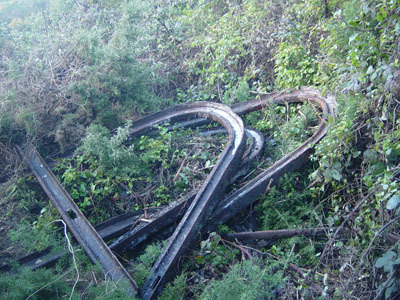 Dumped railway wagons and iron scrap (hidden beneath blackberry). The historic Broderick homestead, that replaced the original homestead, destroyed for the 1937 railway.